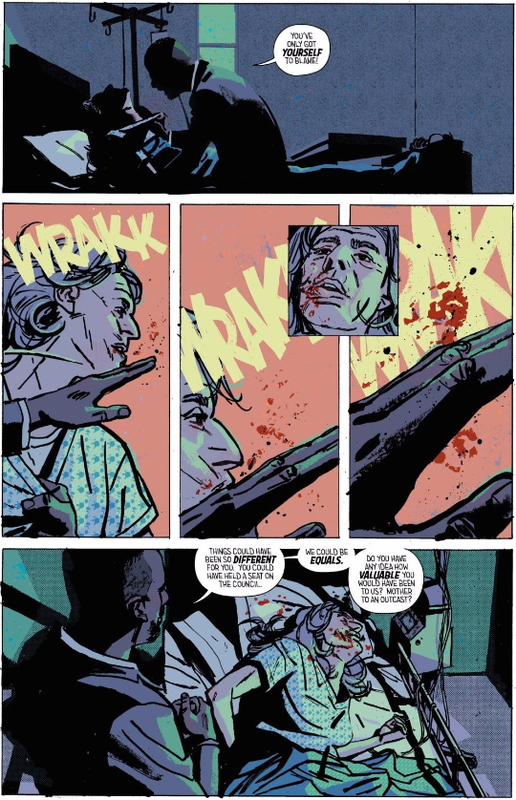 It’s easy to feel optimistic at the start of Outcast 30 — Simon and Kyle have just discovered a new Outcast, Daphne, and they all seem stronger than ever. Or, they will be, but right now they’re exhausted after clearing out a huge safehouse for the merge (or the possessed — we need something to call these antagonists). There’s a bit of tension as Kyle has to convince his family to take in a complete stranger, but even the resolution of that is played for maximum hopefulness, as both Simon and Amber comment on how much stronger they feel in Daphne’s presence. It’s almost enough to feel like they might be in a position of strength — especially after the way last month’s issue ended. That is, until Rowland Tusk arrives to crack the whip on the other side. Our local chapter may have been left scrambling, but it seems like there’s some kind of headquarters they report back to that could dispatch a non-nonsense operative to clean up their mess. The amount of respect he commands from his underlings does a great deal to communicate how scary this guy is, but Robert Kirkman and Paul Azaceta take things several steps further, having Tusk beat up Kyle’s comatose mom — this guy is about as vindictive as it gets. If there’s anything more despicable than beating up a person in a coma, I don’t know what it is. But beyond being an absolute monster, it’s clear that Tusk has a great deal of experience. And so, whatever hope we had for the Outcasts stumbling into a stronger position is immediately trumped by the organizational hierarchy we had no idea existed on the other side. Our guys have been tilting at windmills, but it turns out their real enemy is the wind. While they seemed more prepared then ever, it doesn’t take much for Kirkman and Azaceta to pull the camera back to reveal just how far from prepared they truly are. That’s one hell of a bottom to drop out on us, but it’s one that promises a whole world beyond whatever perspective we’ve had thus far. 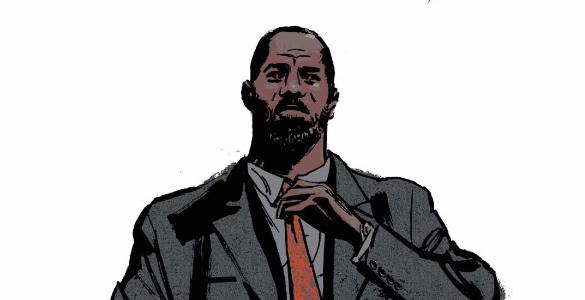 So, I didn’t have a thesis on this, but I’m struck that both of these new characters (and the new character in Reverend Anderson’s story) are all black. It’s particularly notable in that there are virtually no black characters in this series, otherwise. Is the creative team simply adjusting to the previous lack of diversity, or could there be some other explanation?